See also Chandrasekharan in a Log24 search for Weyl+Schema. 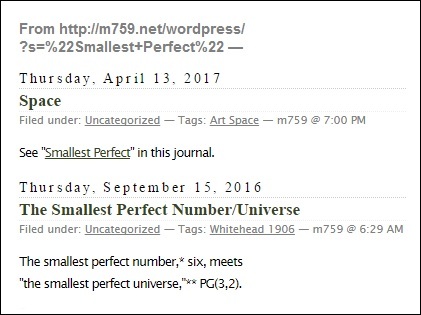 The phrase "smallest perfect universe" is from Burkard Polster (2001). 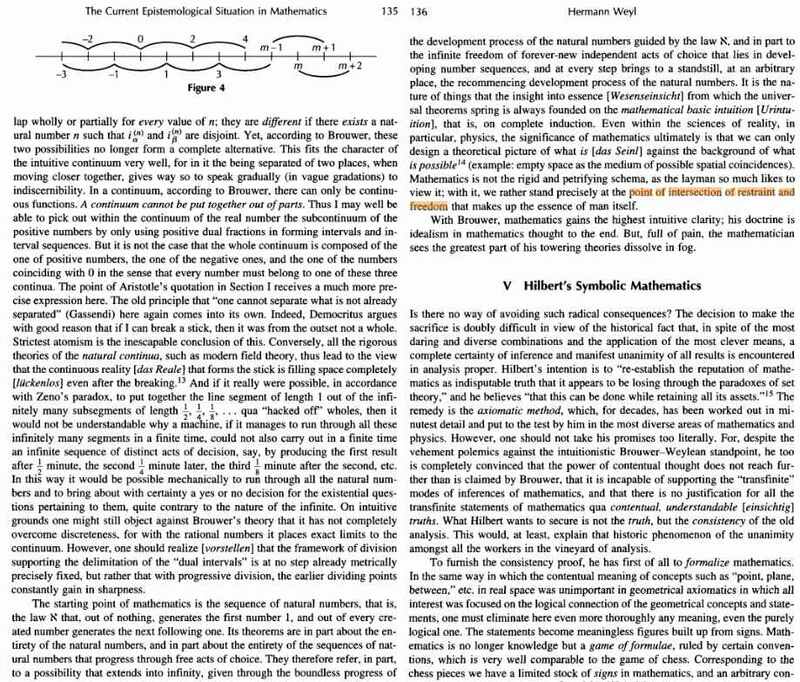 "Mathematics is not the rigid and petrifying schema, as the layman so much likes to view it; with it, we rather stand precisely at the point of intersection of restraint and freedom that makes up the essence of man itself." "Die Mathematik ist nicht das starre und Erstarrung bringende Schema, als das der Laie sie so gerne ansieht; sondern wir stehen mit ihr genau in jenem Schnittpunkt von Gebundenheit und Freiheit, welcher das Wesen des Menschen selbst ist." For some context, see a post of January 23, 2006. [Ramsey, 1926] Frank P. Ramsey. Mathematical logic. 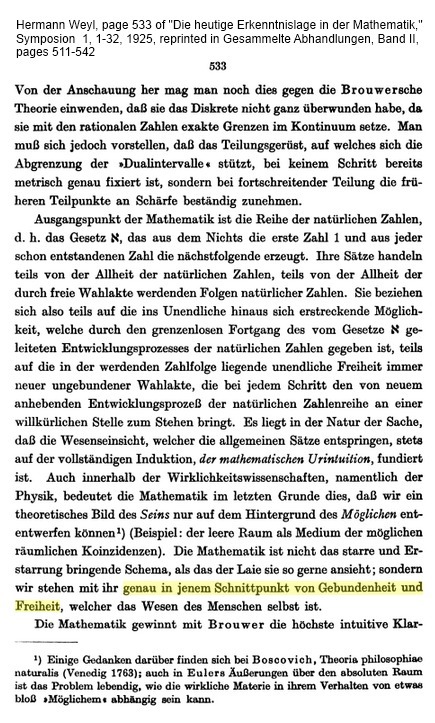 The Mathematical Gazette, 13:185-94, 1926. Reprinted in [Ramsey, 1990, 225-244]. “… I must say something of the system of Hilbert and his followers…. 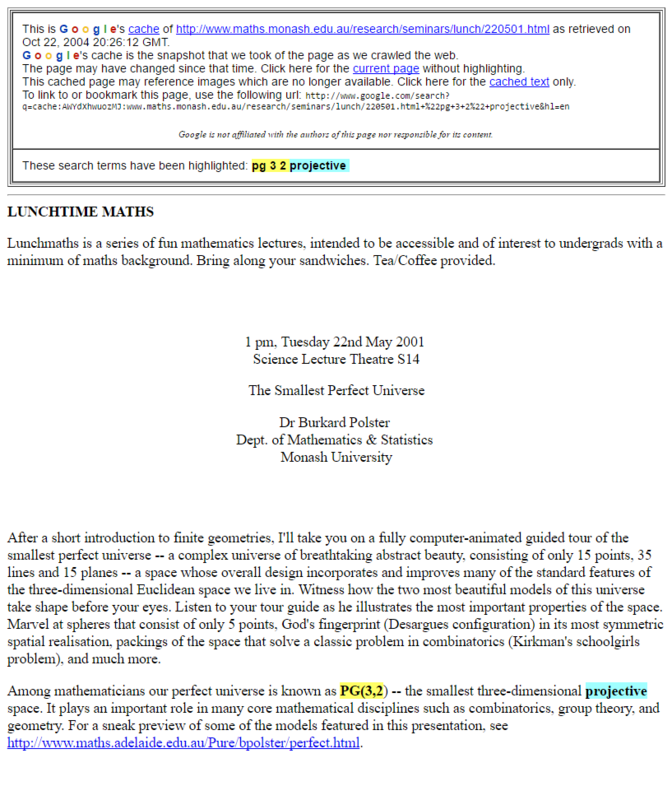 regarding higher mathematics as the manipulation of meaningless symbols according to fixed rules…. Mathematics proper is thus regarded as a sort of game, played with meaningless marks on paper rather like noughts and crosses; but besides this there will be another subject called metamathematics, which is not meaningless, but consists of real assertions about mathematics, telling us that this or that formula can or cannot be obtained from the axioms according to the rules of deduction…. [Weyl, 1925] Hermann Weyl. Die heutige Erkenntnislage in der Mathematik. Symposion, 1:1-23, 1925. Reprinted in: [Weyl, 1968, 511-42]. English translation in: [Mancosu, 1998a, 123-42]…. [Weyl, 1968] Hermann Weyl. Gesammelte Abhandlungen, volume 1, K. Chandrasekharan, editor. Springer Verlag, Berlin, 1968. [Mancosu, 1998a] Paolo Mancosu, editor. From Brouwer to Hilbert. The Debate on the Foundations of Mathematics in the 1920s. Oxford University Press, Oxford, 1998. “What Hilbert wants to secure is not the truth, but the consistency of the old analysis. This would, at least, explain that historic phenomenon of the unanimity amongst all the workers in the vineyard of analysis. To furnish the consistency proof, he has first of all to formalize mathematics. In the same way in which the contentual meaning of concepts such as “point, plane, between,” etc. in real space was unimportant in geometrical axiomatics in which all interest was focused on the logical connection of the geometrical concepts and statements, one must eliminate here even more thoroughly any meaning, even the purely logical one. The statements become meaningless figures built up from signs. Mathematics is no longer knowledge but a game of formulae, ruled by certain conventions, which is very well comparable to the game of chess. Corresponding to the chess pieces we have a limited stock of signs in mathematics, and an arbitrary configuration of the pieces on the board corresponds to the composition of a formula out of the signs. One or a few formulae are taken to be axioms; their counterpart is the prescribed configuration of the pieces at the beginning of a game of chess. And in the same way in which here a configuration occurring in a game is transformed into the next one by making a move that must satisfy the rules of the game, there, formal rules of inference hold according to which new formulae can be gained, or ‘deduced,’ from formulae. By a game-conforming [spielgerecht] configuration in chess I understand a configuration that is the result of a match played from the initial position according to the rules of the game. The analogue in mathematics is the provable (or, better, the proven) formula, which follows from the axioms on grounds of the inference rules. Certain formulae of intuitively specified character are branded as contradictions; in chess we understand by contradictions, say, every configuration which there are 10 queens of the same color. Formulae of a different structure tempt players of mathematics, in the way checkmate configurations tempt chess players, to try to obtain them through clever combination of moves as the end formula of a correctly played proof game. Up to this point everything is a game; nothing is knowledge; yet, to use Hilbert’s terminology, in ‘metamathematics,’ this game now becomes the object of knowledge. What is meant to be recognized is that a contradiction can never occur as an end formula of a proof. Analogously it is no longer a game, but knowledge, if one shows that in chess, 10 queens of one color cannot occur in a game-conforming configuration. One can see this in the following way: The rules are teaching us that a move can never increase the sum of the number of queens and pawns of one color. In the beginning this sum = 9, and thus– here we carry out an intuitively finite [anschaulich-finit] inference through complete induction– it cannot be more than this value in any configuration of a game. It is only to gain this one piece of knowledge that Hilbert requires contentual and meaningful thought; his proof of consistency proceeds quite analogously to the one just carried out for chess, although it is, obviously, much more complicated. “Hilbert’s program… received its share of criticism. Some mathematicians objected that in his formalism he had reduced their science to ‘a meaningless game played with meaningless marks on paper.’ But to those familiar with Hilbert’s work this criticism did not seem valid. Corfield says of this quotation that he’d love to be told the original German. He should consult the above references cited by Richard Zach. For more on the intersection of restraint and freedom and the essence of man’s nature, see the Kierkegaard chapter cited in the previous entry.